One thing is for certain, Bulleit is everywhere. If you’re in a decent bar and you order a rye or bourbon cocktail and you don’t specify a specific spirit, chances are they’ll make that cocktail with Bulleit. Personally, I think that’s great because it’s a good bourbon with a lot of rye spice for not a lot of money. Call me crazy, but I like spending less for good whiskey. But that ubiquity only feeds the angst against the brand, which has seemingly taken over the whiskey world in the last several years. While the standard Bulleit is being served in every cocktail from coast to coast, the brand actually makes a couple of harder-to-find expressions, including this 10 year bourbon that I recently had the chance to sample. 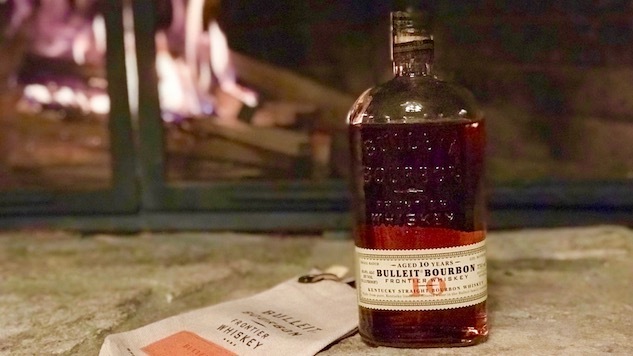 This isn’t a new spirit; Bulleit originally released their 10 year in 2013 and it has racked up some impressive hardware during the last five years. But it’s positioned as the brand’s premium bourbon, and priced at almost twice as much as their standard, no-age-statement Bulleit. So, when you see the hefty price tag from a brand that’s made a name for itself as the new go-to cheap bourbon, you gotta ask yourself, is it worth the extra cash? It’s always a crapshoot when you’re picking out a new bottle of whiskey, and the higher the price tag the riskier the gamble. Fortunately, in this case, you already know whether or not Bulleit 10 is worth the extra $20-$25. All you have to do is ask yourself, do you like the standard Bulleit? If so, then splurge a little, because Bulleit 10 is like a super Bulleit for Bulleit fans. We’re talking about a whiskey that has the exact same mash bill as the standard (68% corn, 28% rye, 4% malted barley) and bottled at almost the same proof (91.2 for the 10-year; 90 for the standard). It’s the same whiskey, only aged for several years longer in charred American oak barrels. So, what does that aging do to the whiskey? It adds complexity, which is something regular Bulleit is missing. While everyday Bulleit is known for its spice (thanks to all that rye) and not much else, 10 year Bulleit delivers plenty of stone fruit and notes of caramel and vanilla in the sip. It’s not a candy bar, by any means, and what’s crazy is that the extra time in the barrel hasn’t really toned down that signature Bulleit spice. The peppery finish still sweeps everything away at the end of the sip just before a dry finish. But you get more bang for your buck on the ride, with plenty of oak and ash lingering in the sip, and even a little bit of earthy smokiness that you’d typically find in Scotch. Is it better than the standard? Yeah, it’s better. Hands down. Is it a premium sipping whiskey? Maybe. It’s definitely good enough to drink neat and too good to waste in a heavy-handed cocktail. But is it as good as other well-aged whiskies in a $50 price range? Probably not. But if you’re a really big fan of Bulleit, you owe it to yourself to try Super Bulleit.